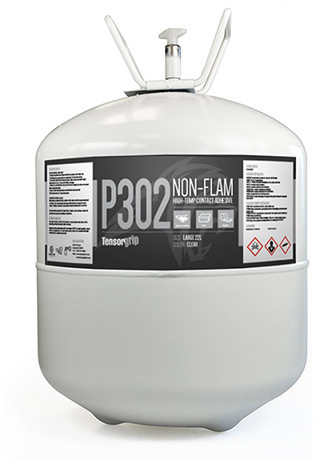 Tensorgrip® P302 is a non-flammable, high performance industrial spray contact adhesive formulated for general contact bonding. Designed to deliver a smooth and strong bond in nearly any application while maintaining perfect non-flammable properties with leading Zero-Flam Technology. Non-flammable solvent and non-flammable propellant. VOC free • Qualifies for LEED®-NC & CI EQ Credit 4.4: laminating adhesives shall contain no urea formaldehyde resins. 22Liter Large (34 lb.) = 5.81 Gal. 108Liter Intermediate (155 lb.) = 28.53 Gal. 216Liter Jumbo size canisters (308 lb.) = 57.06 Gal.